Theme is build like a presentation wall, to be a place where you can showcase your products or services. The category template is created in an original way, using the powerful thumbnail WordPress option. Random thumbnails lead to posts, being great for websites with huge amount of content, where usual the old posts are buried in archives, from where is hard to get them alive. Redminton use the WordPress like CMS and you can manage all the functions presented in theme live demo example from your administration panel, even is talk about colors, feed settings, twitter or drop down menu columns, advertising and sponsors ads etc. 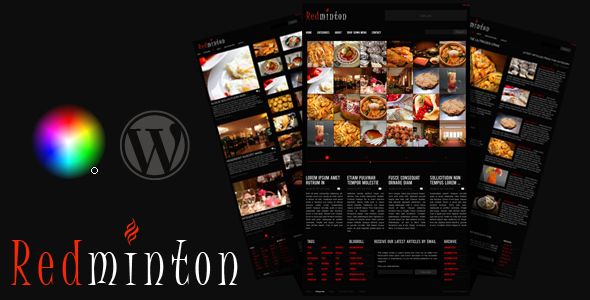 Redminton theme was listed on AWWWARDS in an article about 25 of the Best Premium WordPress Themes 2010 – 2011. Restaurant, pub, Cafe bar, drinks, catering, food recipes, wedding websites, portfolio for creative, personal blog, online magazine, hotel and spa, architecture, photography, sport, science, travel and tourism, real estate, art, technology, entertainment and many more. After purchasing the file, you will find useful this post about how to maintain and edit without touching the core files of the theme. This will save your time when theme have updates to replace. The update_notifier.php file changed. In case you receive an wp-admin warning for a file what cannot be open or found, please download again the package and replace this file on your server..
CSS fixes for drop down menu. Hide empty tags, in case you chose for the default footer tag widget (theme options) a number more bigger then the tags number available in your WordPress. theme update notifier. 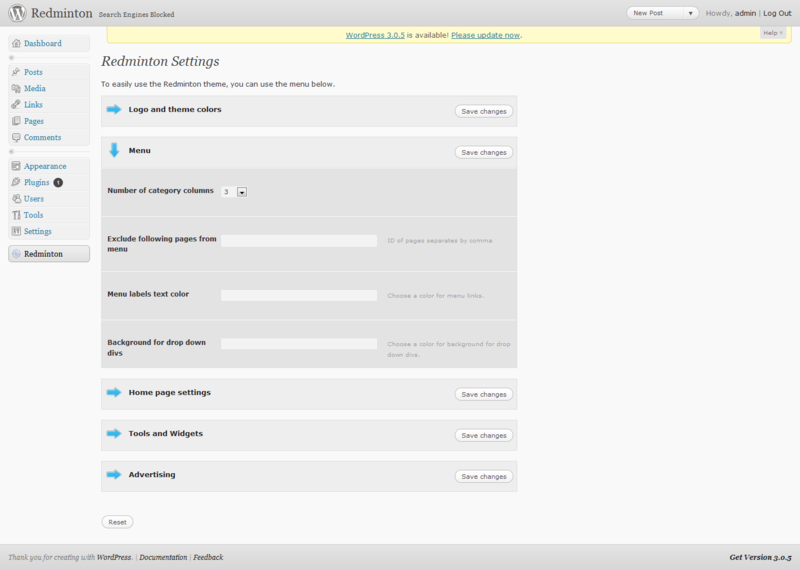 from now, when a new update is available, you’ll get notified from your WordPress dashboard. added theme option to remove category from dropdown menu category. page template for blog. you can use a static page template to load your blog. 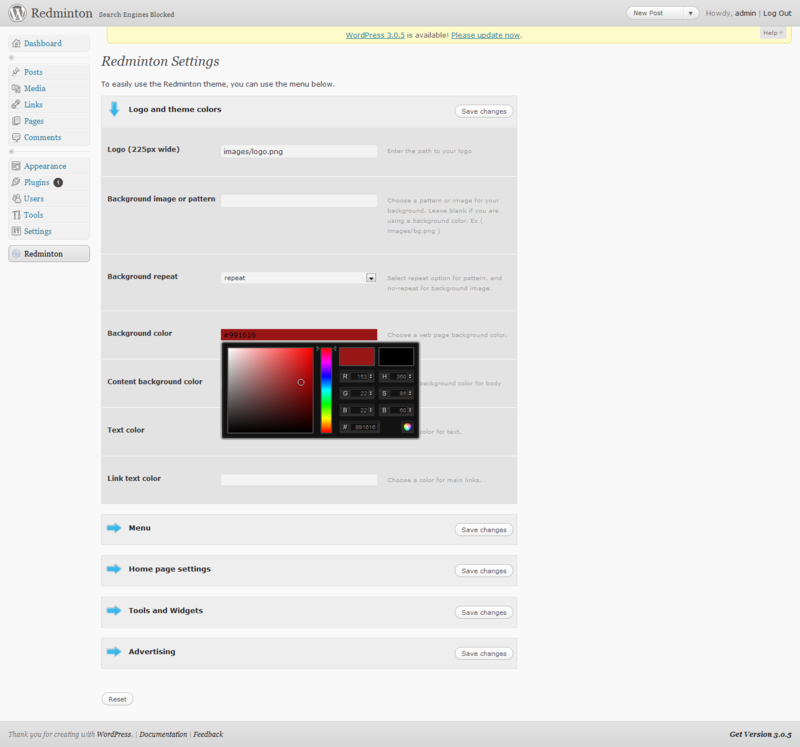 menu option to activate the custom wp menu and disable the default one. 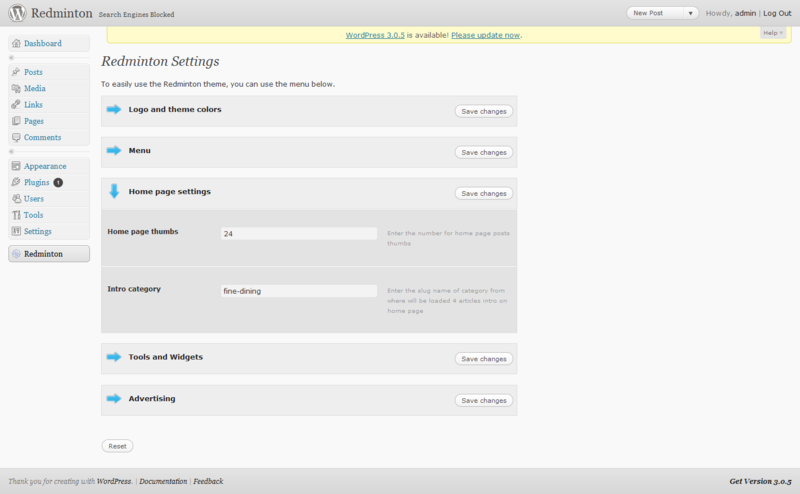 theme option for default footer widget, disable / enable. theme option for font size at “tools and setting” section. theme option for height header. get more room for bigger logos. image fallback for category posts listings. 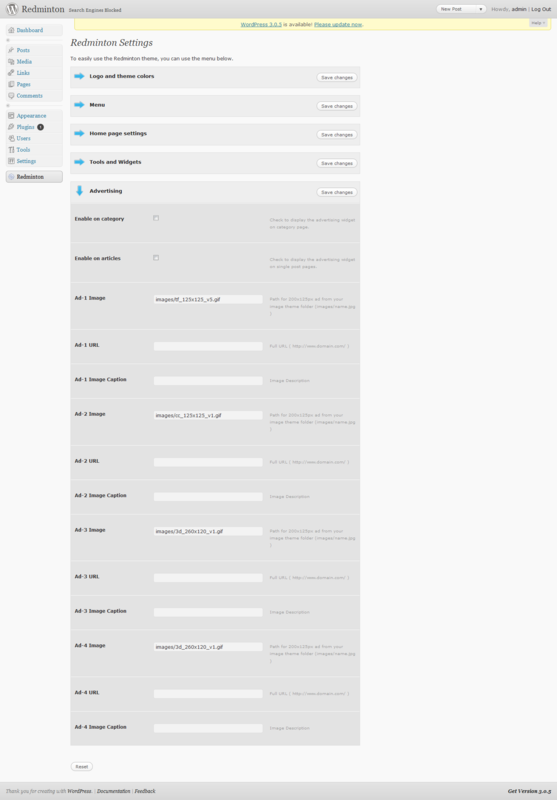 translatable theme with .po file included. 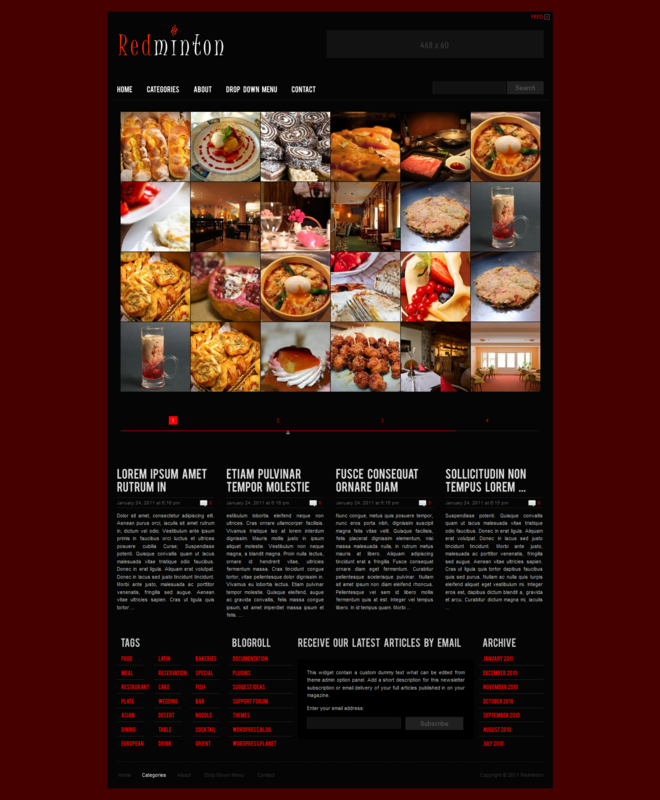 footer area widget ready for entire theme.